Per Deltanet, RDU and AUS will be growing, especially AUS as it seems that management believes DFW is impenetrable. I don't know why people get so worked up about someone saying something that they know full well that they can't share that information. There seems to be a disconnect between what they're putting out to us and what they're putting out to the public and until such time that tye company tells us one way or the other, I'll go with what the company says versus the media. All I’m going to say is DL is adding more management to RDU. Types of positions that don’t exist outside of large stations or mini hubs. I do believe DL has more plans for RDU than people are willing to admit. Could be a cost saving measure more than flights, but moving labor. In 2018 and technology there's alot of jobs that don't have to be in Atlanta. They could get some nice incentives to move a few departments or found some way those positions are cheaper operating in the RDU area. It could be more than flights could be labor savings. RDU is clearly a focus city for Delta but also nice and close to ATL, seems possible. I would take these jobs rumor as RDU is in for the long term more which is good news, clearly will continue to be a focus city, but doesn't mean they have to make it a hub. Sorry, but you don't move management functions outside of the consolidated mother ship to cut costs. We're not talking IT or call centers here. Also, they're not just rumors. Delta have added both a Sales General Manager and a team of account executives to RDU in the past couple of months. You don't do that unless it's going to be a notable focus city where you want to have corporate account facing boots on the ground. Exactly. There’s more to this story. But unless it’s made public, my lips are sealed. It is concerning that DL has not announced SXSW service for AUS-AMS in 2019. I assume the route did not do well enough to invest bringing it back for the 4x frequency it was? Per Deltanet, RDU and AUS will be growing, especially AUS as it seems that management believes DFW is impenetrable. Strange DL would pick DFW over AUS as the test market for the Cseries if this is the case. A220 is based in lga and aus is beyond perimeter. What additional growth can we see from RDU? RDU-SAT, MCI and SJC? RDU is DL's test market for that size/type town. It will be a special type of hub/focus city (secondary cities with top companies/high income/high education/high discretionary incomes). Once you have that down I think it's DL's intention to duplicate the concept. AUS seems only natural. All DL is doing is connecting the dots. They know their traffic flows. They know where the higher margins are coming from. They are optimizing the hubs' efficiency by adding the focus city flying. This isn't rocket science. It's the evolution phase DL is currently in. There aren't that many RDU's and AUS's in this country left to fit that current profile DL is after. Perhaps BNA. Unfortunately Delta is not "adding" 100 FT spots. These positions will be opened up on the internal bid system and awarded on a seniority basis. The holes in other stations created will then be filled with seasonal and regular Ready Reserve positions. So, technically yes there will be positions added, just not benefitted FT positions. There is no question they are trying to grow AUS. But they have no point of sale at AUS at all. It will be a long uphill battle if they tried. From other threads and discussion, throwing the c-series into DFW is a competitive move. From a road warrior perspective the aircraft is “mainline” with everything that implies vs regional (even though they’re improving too) hence it’s the best aircraft for not only costs but service too. I agree with everything you have written. The interesting thing to me is that, after the merger, Richard Anderson talked about these kinds of places as "S curve markets" (i.e. mid-sized stations in mid-sized cities), but they did not really got much attention. Many gained service to LGA after the slot swap and LAX and/or SEA as those operations grew, but many also lost service to CVG and MEM as those hubs drew down and some lost DCA as a result of the slot swap. Aside from the identified focus cities, aircraft gauge has changed unevenly. BNA has seens some p2p service added (BOS - not the first time DL has tried it but the first time it has stuck - and RDU), and I would also throw IND into the mix with the CDG service. I can't speak for the other cities, but DL is in the midst of its biggest advertising push in BNA since the merger. For all the naysayers here, I would pay close attention to BDL757's post about the internal memo. Looks like AUS, and to a lesser extent RDU, are about to see a lot more Delta flights. Stay tuned. Delta has quite a hill to climb in AUS, as they are the #4 carrier there. I think the biggest glaring hole in the RDU network for DL is PIT. Sure, AA's still flying that one, but given AA's recent penchant for pulling out of non-hub flying, I think DL could pretty easily push them out (same goes for BOS-ROC/SYR/MDT). For anything from RDU that overflies ATL (all three routes you mentioned to some degree), I think there has to be a really strong market that's willing to pay a premium. I don't think SAT fits that bill. MCI maybe - that's less of an overfly, and MCI has a stronger business market. SJC certainly has the business ties to RDU with the tech industry, but the difficulty is stage length. However, that's a route with no direct competition (SFO-RDU does have nonstops), so maybe DL would be willing to give it a shot. It's amazing how much larger even DEN is still than AUS for Delta. DEN is not a city i associate with Delta much at all. AUS has alot to grow, they are a pretty small player right now. There has been quite a few posts on this subject already. Anyhow, here is the data from Q2 on 3 routes where DL does not have dominant position on the other end and you can see how well they are doing on them. Since AS and B6 have minimal Point of sale at AUS, there is no reason for DL to be doing that much worse than them if it had point of sale at AUS. And on LAX, it has lower average fare than AA despite operating smaller capacity aircraft. If DL has point of sale at AUS, it should be able to get higher fares than AA on an aircraft with less seats to fill. Oh good grief. another mention of Austin by Delta and a bunch of new hyperventilating and fanboying and we have now a 3rd thread about all the goings on Delta will be bringing to AUS. Seriously, these 2 cities, RDU and AUS were "linked" only in the sense that they are 2 cities that were moving ramp positions in-house. It does NOT mean and the news release does NOT say that either of the cities, especially not AUS, is going to be a focus city, a hub, or whatever. People who say things like "I know more than I can say; I'm keeping my lips sealed about AUS" just give this aloof vibe that there's this huge announcement coming (that keeps never coming). And people who say, "wait a minute, the article/news release/whatever doesn't say that" get told we are berating or belittling people simpy by pointing out facts. I'm sorry, I didn't mean to cause such a stir. Usually the article on news.delta is the same exact internal article so I didn't check the link. Someone can change the title or delete it if they want. Interestingly, though, if you go to news.delta.com and put your cursor on the story (but don't click it) a little preview comes up and says "with these changes, Austin and Raleigh are set to become the two largest non-hub stations in the system". This is what is in the article on deltanet but missing from the public story. in internet marketing, you write a separate summary of the bigger article linked. Just because the summary says something doesn't mean the content was summarized correctly. For clarification, read the whole article. The internet PR function, loading the article headline correctly, is a junior level position. In other words, you're reading too much into a one-sentence summary (written by a nobody) that RDU and AUS will become the biggest non-hubs in DL's system. AUS (especially) NOT HAPPENING. nothing in the actual article you mentioned says so. Last time this happened it was some news reporter-ette misstating summary of a Delta executive interview that AUS was becoming a focus city, someone from a.net contacted her about her conclusion, and she edited to say that was not stated during the interview, it was a misstatement she made, nobody from DL said such a thing. I just laugh at the whole love affair with RDU. What do you mean? What's laughable? Just so everyone knows, I copied and pasted the following from news.delta.com (it's what shows when you hover your mouse. Given that it's over a day old and no retraction/correction has been made...I would have to give it some merit. To those who laugh it off to a "junior-level" staffer issue...grow up. It was confirmed that this was how the internal article was written. Perhaps it was a "junior-level" staffer that made the mistake writing the article and not including that information. Needless to say, everyone looks at these full-time jobs and says "oh, that's nothing." That's just full-time. When I worked for United (pre-merger) we had ~100 employees above and below the wing. Of those, just 22 were full-time. The personnel comparisons with WN are not apples to apples either...WN ramp staffing is higher than anyone in the industry to facilitate it's "quick turns." It is standard for them to have an ops agent, 2 bag runners, 2 people in each pit (4) and two people at the bottom of each belt loader (4) for a total of 13. At UA we had an ops agent, a person in each pit, a bag runner, and 1 person at the bottom of the belt loader for a total of 5. BTW, if you don't want to discuss AUS and the possibilities, skip over the thread, stop reading, close your browser, or do whatever it takes to lower your blood pressure. It's not rocket science. This is an open-forum discussion board, and if you've been here any length of time, you know the speculation goes from spot-on to tin-foil hat conspiracies. It's part of the experience and it's really up to the mods to scold people...not any joe on the forum. If you have an issue, report it. Otherwise, move on. It's really hard to tell because Delta is such a propaganda machine we sometimes don't know what their true agenda might be. Same could be said for the DTW crusader! According to Bureau of Statistics they are number 3 by market share. so again, do you mean 3? Your seem more upset than any other post you are referencing on this thread. Needless to say, everyone looks at these full-time jobs and says "oh, that's nothing." That's just full-time. When I worked for United (pre-merger) we had ~100 employees above and below the wing. Of those, just 22 were full-time. That doesn't seem very far off from DL, considering AUS is getting 30 of the 70 jobs. What would BNA accomplish for DL? Nothing. I can only look at things based on the yields that I see out of different cities. I am simply saying that they have very strong point of sale in both ind and bna. If they wanted to build a larger o&d operation there, they will likely be able to get a focus city operation easier than in Texas where wn aa and ua are all stronger. By obviously if they make a corporate decision to expand at aus, they will do it. OK here's how news releases work: I've screenshotted the lineup of delta news releases including the one about RDU and AUS. Once you click through to read the ACTUAL ARTICLE the part about AUS and RDU becoming the 2 biggest non-hubs in the system GOES AWAY. It is NOT in the article. You are quoting the words from the jump page that some jr level marketing person probably scanned over, misinterpreted, and now anet has it's 3rd Austin concurrent Delta thread The sentence you reference is SOMEONE'S attempt to summarize THREE PARAGRAPHS into ONE SENTENCE and it's NOT what the new release says. It's what a jump page says on a list of hundreds of other news releases. The 1 sentence isn't the news. The NEWS is the news, if that makes sense. What they actually said in the news release, not someone's (mis)interpretation of 3 paragraphs in one sentence. The sentence you are highlighting out of context of the whole news release GOES AWAY when you click thru to read the actual news article. For everyone's convenience, here is the actual news release link on Delta.com. If you can find something in it stating that RDU and AUS will become the 2 biggest non hubs for Delta, please let the rest of us know. The actual sentence in the article says they will be TWO **OF** the largest. NOT THE TWO LARGEST. 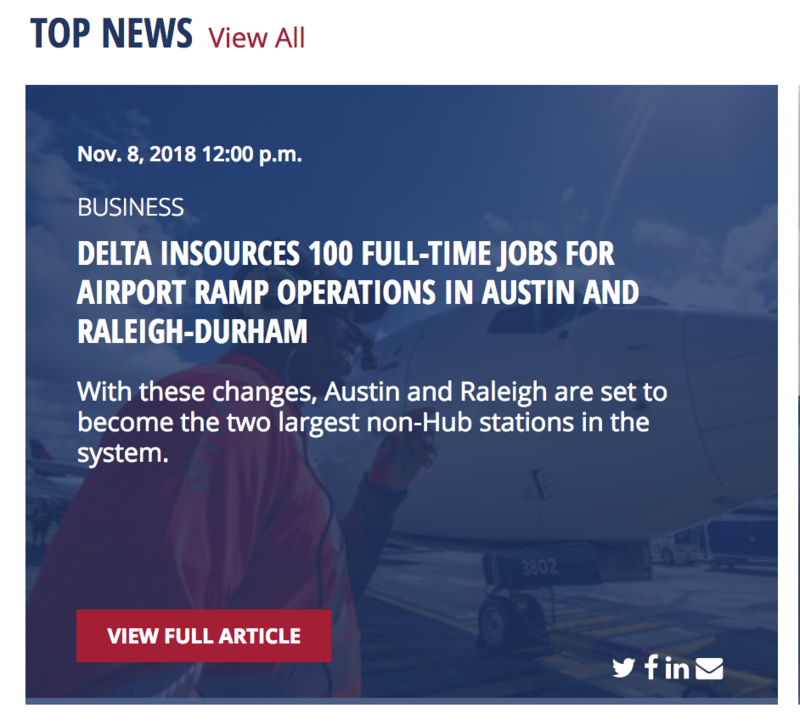 Look at the title itself of the news article and the link: The main focus is the 100 jobs, jot that AUS and RDU are making this big move as nonhubs. Geez. So in a discussion board, we are free to post things that disagree with the premise of the post. That's part of the discussion. That's exactly what's going on here. No need to tell me to skip this thread and close my browser. My blood pressure is fine. It's just amusing the wishful thinking people do on here for airports in their favorite cities to have their favorite airlines bring in more of their favorite planes. That's just not how the business works, and that's not berating or scolding anyone. We're here to discuss facts or opinions, but this is clearly a misinterpretation of a single sentence, just like the single linkedin job posting generated 10 pages of "Austin is the next DL focus city!!!" Interesting point, perhaps they will add this later? In any case, there's been a ton of talk on various threads here about Delta turning AUS into a focus city and perhaps hub long turn. They are certainly a day late and a dollar short in terms of the important TATL market; both OW and Star have beat them to it. That doesn't mean they can't turn AUS into said focus city if they want, but those routes are still yet another brick in the path of that bicycle. Totally agree that the topic title is misleading. Nothing in the article suggests anything about growth in operations or being the "top two largest stations." And even if there is an internal document with that phrase, the way DL defines hubs/focus cities is totally nebulous. That being said, it would be interesting if someone could provide a list of stations where DL has in-sourced ground operations to see how AUS and RDU compare. This forum is for factual discussion of civi aviation. It literally says that on the webpage. Until then, this should say rumour. Period. This doesn't mean that I want a row or to berate. I come to this forum to have factual discussions about civil aviation. Is this screenshot from the Delta News good enough for you guys or shall we keep going? AUS and RDU to become two OF the largest, not THE TWO largest. i posted the jump page and the actual news release, pointing out the error. You're posting the page with the headline "error." THE ACTUAL ARTICLE says nothing like the little blurb you are focused on. In other words, you are focused on the wrong text, unless you can show your news article to back up what I'm saying is wrong text. Neither RDU nor AUS will become the 2 largest non hub stations, and the news release itself says NOTHING OF THE KIND. I say we keep going. Last edited by LovePrunesAnet on Sat Nov 10, 2018 1:40 am, edited 2 times in total. i posted the jump page and the actual news release, pointing out the error. You're posting the page with the headline "error." I say we keep going. That's not an error. The sentences are arranged completely different. "The two largest" and "Two of the largest" is not a mistake you make by forgetting the word "of". And the OP was only stating what he read (internally or on that headline), if DL made a mistake on it the people jumping on him for being misleading are misdirecting their dislike. That's not an error. The words are arranged completely different. "The two largest" and "Two of the largest" is not a mistake you make by forgetting the word "of"
I know you WANT it to be true, but that doesn't make it so. Please post the actual screenshot of the article itself. If you're correct, I'll admit I'm wrong and drop it. If my hunch is correct, the actual wording will say TWO OF THE LARGEST. I showed my proof, respectfully, can you show yours? The jump page you've already showed is not proof, it's a summary that is misstating the content you see when you click through to read, at least on the public delta media PR page. They are #4 in market share. I have no desire either way for RDU or AUS to become the largest non-hubs, completely irrelevant to me. As I've stated, the OP posted what he did based on the internal memo and the headline on Delta News, regardless if the link posted doesn't state it. He has explained what he said and people have chosen to ignore it. Whether it is false, wrong, or right I have no interest. But he did not post misleading information, which is all I'm trying to say. Last edited by gatibosgru on Sat Nov 10, 2018 1:48 am, edited 1 time in total. if Delta was going to make an announcement that 2 stations were going to be come the 2 biggest non hub stations in the Delta network, I'm fairly certain they'd have a press release JUST ABOUT THAT. Instead that is the summary sentence on a jump page to a news release about 100 contract ramp workers being brought inhouse, and nothing more. The article itself simply states that AUS and RDU are TWO OF THE LARGEST Delta non hubs. Like that Delta views them that way already. NOT that they are being "transformed" or that is their future. OMG this is ridiculous. I have no desire either way for RDU or AUS to become the largest non-hubs, completely irrelevant to me. As I've stated, the OP posted what he did based on the internal memo, regardless if the link posted doesn't state it. He has explained what he said and people have chosen to ignore it. Whether it is false, wrong, or right I have no interest. But he did not post misleading information, which is all I'm trying to say. I guess the fact that you won't post the actual article proves my point. The news release is not a private document. The article is on the original post, feel free to go to page one, click on it and read it. Again, I'm not arguing what the article states but go off. Last edited by LovePrunesAnet on Sat Nov 10, 2018 2:10 am, edited 1 time in total. Just a thought, but could DL maybe mean that they will be the largest non-hub stations simply by number of DL employees? gaitbosgru: I posted the same article IN CONTEXT and it does not say what you or the OP are saying it says. Please stop perpetuating this confusion. Last edited by LovePrunesAnet on Sat Nov 10, 2018 2:37 am, edited 1 time in total. ** 12 months ending July of each year. How many contract positions does Delta have that are being replaced by Delta employees? Asked another way, how many incremental positions (whether contract or Delta employees) is Delta adding? Is there a tipping point, e.g., based in number of flights, above which it makes more sense to use Delta employees vs contract employees? Or is it more art based on a number of factors, e.g., optics and preventing unionization? Which stations larger than AUS and RDU use contract employees? Another point, people are getting all boned up thinking these stations are going to double in size and become the largest overnight. No doubt Delta has a multi year glide path with key milestones to grow these markets. If indeed growth in these markets is a strategic imperative, Delta will be aggressive but not careless in adding service. Research must be hard for you. The most accurate source is the airport itself. and also keep in mind that this is mainline only. UA has a lot of regional flights due to the proximity of the hubs which makes them larger than DL at AUS. Comments like "Counting must be hard for you" is rude and not helpful in a discussion. Regardless, what will Delta’s strategy be to grow market share? While these metro areas are growing its not enough to sky rocket Delta to such a lofty position without taking market share away from competitors? Ding ding, I believe we have the winner here. “With these changes” what are these changes? “These changes” refer to something in the article/ press release changing. What is changing? Well the article says that staffing is being brought in house. These changes will bring AUS and RDU up the ranks in station size, by relevancy here we would be referring to the staffing size of the station. If this were about flights or passengers carried the article would make some mention of it as part of “these changes”. 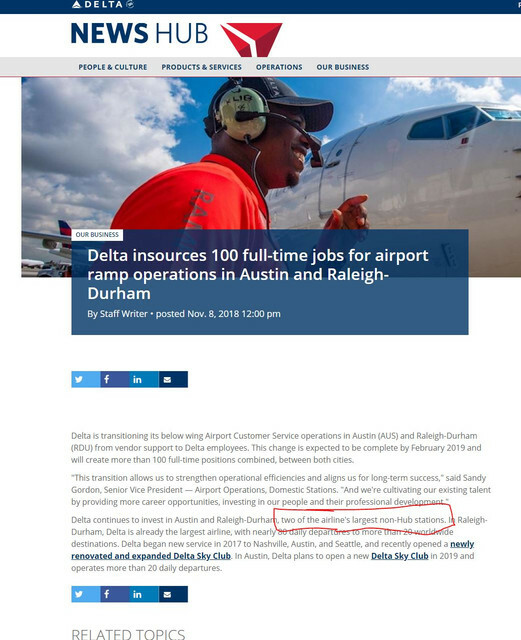 Considering how many of deltas airports are outsourced, I can see how 100 full time jobs between 2 stations would make them some of the largest. Man after all this "AUS is a focus city" chatter, I finally go look at which cities DL flies non-stop to and it's only 8 destinations. F9 last year also decided to make RDU and AUS mini hubs ...... there has to be something to both of these airports. Its not like either are major tourist or major cities. Its almost like DL and F9 picked medium sized airports to make them mini hubs. I am guessing its cheaper to run a mini hub through a medium size airport vs attempting to do this at a bigger airport. Is this what anybody else got? AUS can arguably be viewed as DLs new southwest footprint in the likes of what was lost when the DFW station was closed. A maintenance building is allegedly slated for construction somewhere on the airfield in the next 12-18 months to back up the eventual flight increases. A220-100 stripes have been painted on the ramp gates, which furthers the past theory that AUS was going to be one of the stations where that new equipment would eventually be deployed along with the west coast and JFK corridor deployments. As many already know, the one hundred aircraft A220-100/300 order is theoretically replacing a portion of the the Delta Connection regional operation nationwide, since the A220 series will be staffed with DL flight crews. Regarding AUS ramp operations according to information from those involved, DGS will be done Jan 14, 2019. DL ramp is supposed to be in place February 2019 if not sooner than the last day of the DGS ramp. A DL ATL executive friend of mine who previously worked as an AUS OSM, believes the company wanted to match a more dependable workforce with the upcoming increase in flights, so they spent the money for DL staffing. Regarding AUS and RDU ramp upgrades, both stations will have identical changeovers. From conversation with ACS staff and what the entire ramp/cargo group was told directly in the Delta Mgmnt conference call Thursday ('The Thursday Massacre'), there will be 45-50 DL Ready Reserve ramp positions filled at each station. So no.....the 100 new positions will not be split with RDU siphoning off more from AUS because of current size differences. (My understanding is BNA may be soon going through the same ramp conversion). If RDU hires more than 50 it will not come from the AUS inventory. Anecdotally, it appears the company views both RDU and AUS as long term equals, with them both being their future premiere revenue stations of domestic growth that are not yet as well established as larger existing 'focus cities' such as MCO, BOS, or PDX. I believe the long term DL plan for AUS is the 'focus city' model in terms of a foundation of 60 flights a day with a small international mix. Concerning ABIA international airline changes in the spring, Lufthansa starts regular TATL traffic in March on a 333. Condor is out. British Airways finally did downsize their 744 October 28, but they replaced it with a 773. A bit of a pleasant surprise there. No idea yet what equipment they will use for SXSW in March.